Welcome to MadrasahZone, an Al Mahdi Madrasah site to provide parents, students and teachers with secure access to madrasah and student information. and to allow students, parents and madrasah staff to interact on a regular basis by sharing madrasah news, assignments, attendance and homework. Al Mahdi Madrasah provides Islamic educational services on Sundays for approximately 42 weeks. These services are provided by dedicated volunteers. 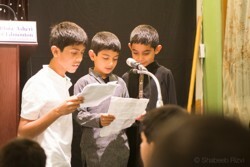 The classes are structured for Islamic education and caters for students of all ages. School hours are from 10:30 a.m. to 2:00 p.m. and the coursework is based on a well-defined curriculum. The program is geared to provide a comprehensive understanding of the fundamental principles of Islam. Our instructors do not receive any remunerations for their services and are dedicated in their commitment to this program. The first day of Madressah will be Sunday, September 23 following the first 12 nights of Muharram. Registration for returning Madressah students will begin online through MZone on Sunday, August 26. Parents can also register their children in person on Sunday, September 9 at from 10:30AM - 12:00PM at ISIA. Registration for new Madressah students will take place in-person at ISIA on Sunday, September 9 from 10:30AM to 12:00PM. Classes are available for students aged 5 through 16 (age as of January 1, 2019). Fees will remain the same as last year ($195 per child (member) and $275 per child (non-member)). Payment must be made in person on Sunday, September 9 (10:30AM - 12:00PM at ISIA) in two cheques of equal amounts. Each family will be asked to sign-up to volunteer for one Sunday during madressah hours to provide administrative support. At the time of registration, a third cheque of $50 must be provided - that will only be cashed in lieu of the parent volunteering. Al Mahdi Madrasah If you have any questions, you may email madressah@jammat.org. All contents copyright © Al Mahdi Madrasah. All rights reserved.